Caption slip reads: "Photographer: McCarty. Date: 1951-09-05. Reporter: Rose. Assignment: Traffic Accident -- West Adams and 12th Avenue. Left to Right: Mrs. Julian Raymond and Leo Lomeli squat to comfort traffic accident victim, Doris Hilton, 22, model. Officer A.R. McCartney gives toximeter baloon test to Miss Hilton's companion, Robert F. Lee, 38, sales manager, who was booked, University Station for drunk driving. 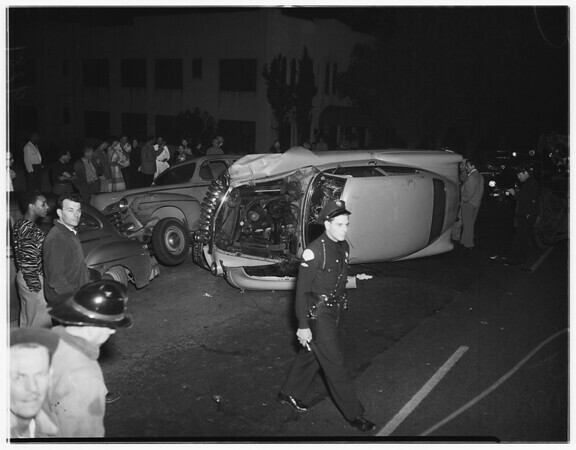 General view of Lee's car on side against parked car with Miss Hilton lying in foreground. University Station Detective P.C. Barone inspects Lee's car on its side".